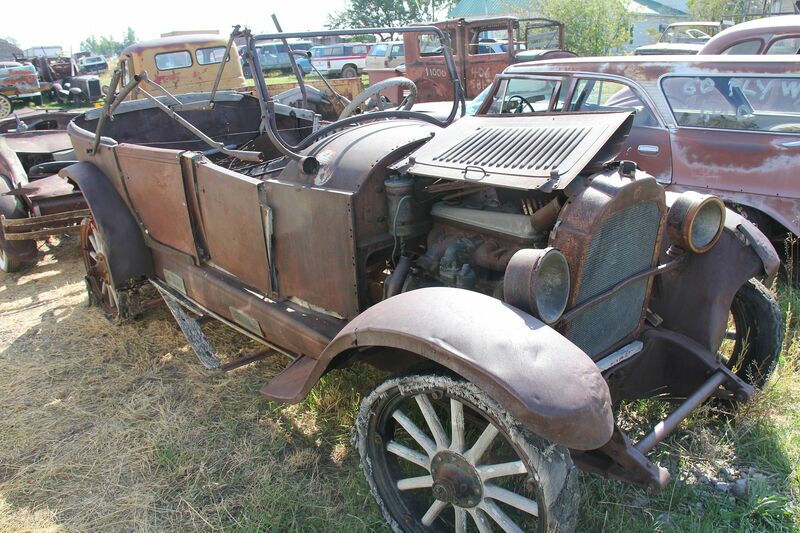 I think it's a early twenties Willys-Knight based on the radiator shape. It had no badges or markings that I could find. What do you think? Similar, but no bar between the frame rails at the front on the green car. The asking price painted on the side was $1500. The fenders, especially the rear were in bad shape. 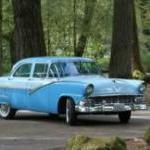 The car needs all new wood and a lot of work, but a dedicated guy could probably restore it. Thanks Joe. Kathy and I had a blast making it, glad you enjoyed it. I must agree....the video was awesome! Yes, the rusty touring is a Willys-Knight. Looks like a roadster behind it. It could be a Willys Knight. Yes, that is correct. I need reminding sometimes; sadly more often now than I used to. I do however remember seeing one similar being used at a friend's wedding some years ago. One thing that might put off a would be restorer from returning it to stock would be the engine designed by Charles Yale Knight. 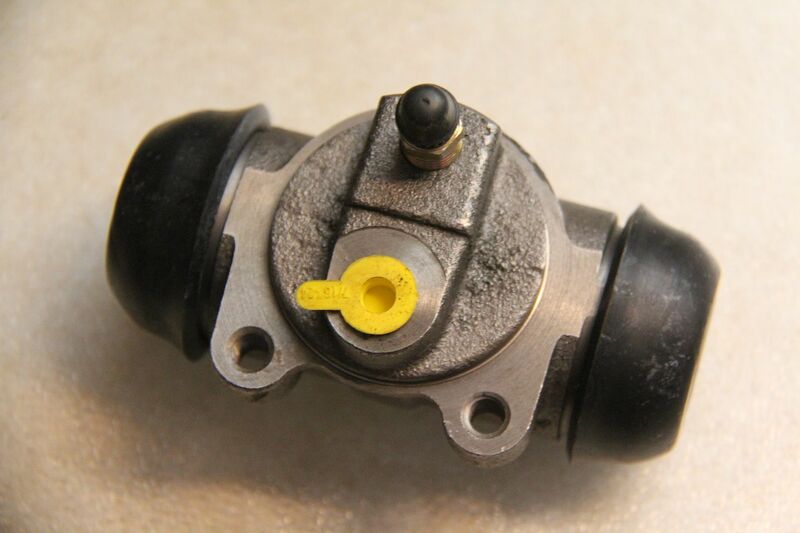 Known as "The Silent Knight", the sleeve valve is very different and much more complex than a conventional poppet valve engine and could prove very expensive and tricky to rebuild. They also had a tendency to smoke quite alarmingly due to the design of the valve gear. Being exceptionally quiet, these engines are to be found in early British Daimler and other B.S.A. derived cars as well as Mercedes Benz. Later in the '20s Burt McCollum designed a simplified version and instead of a sleeve within a sleeve arrangement a single sleeve was utilised. Being much lighter, simpler and therefore cheaper to produce they were developed by Bristol and Rolls Royce for wartime aircraft. 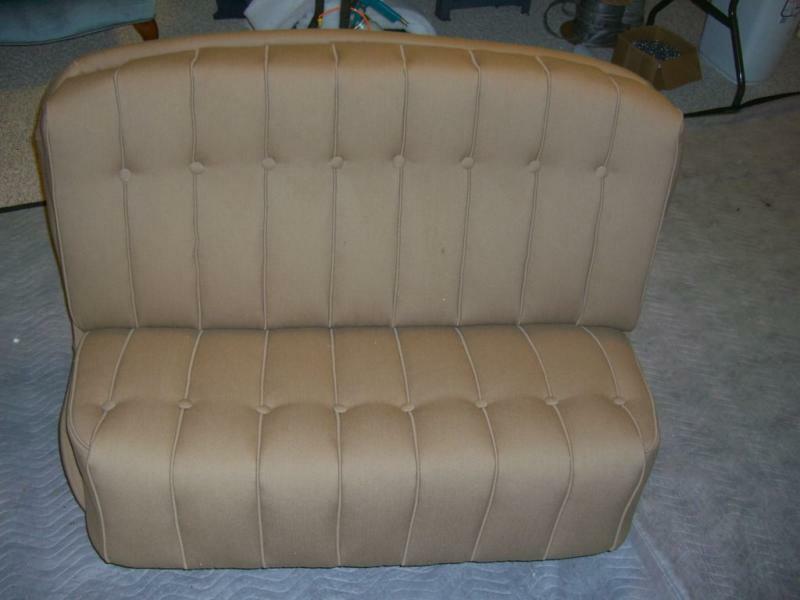 I have the rear seat upholstery finished. A while ago I discussed the amount of fading i found in the original material: it had gone from a medium brown to a tan color. The fabric I bought from LaBaron-Bonney is a very close match to what I found in a few spots where the sun never reached the original. The new fabric is a wool broadcloth, like the original, but a bit thicker. For some reason it looks a bit shiny in the photos, but it's not. 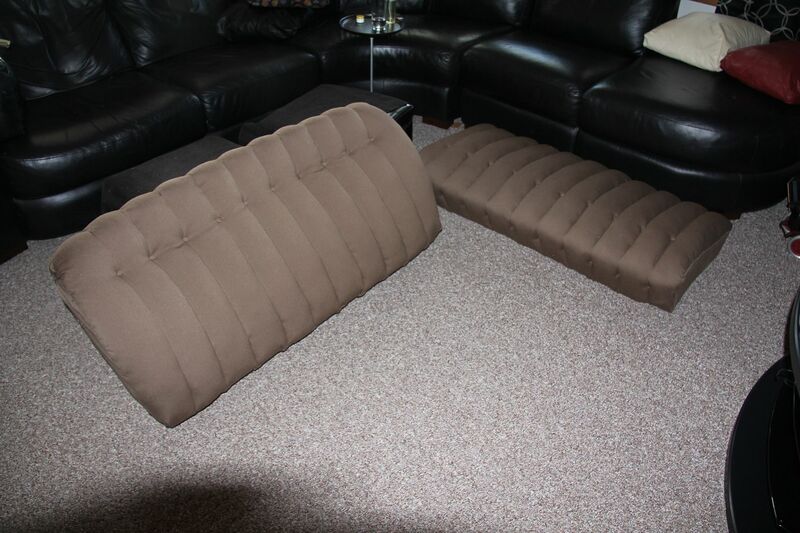 And the newly upholstered cushions. 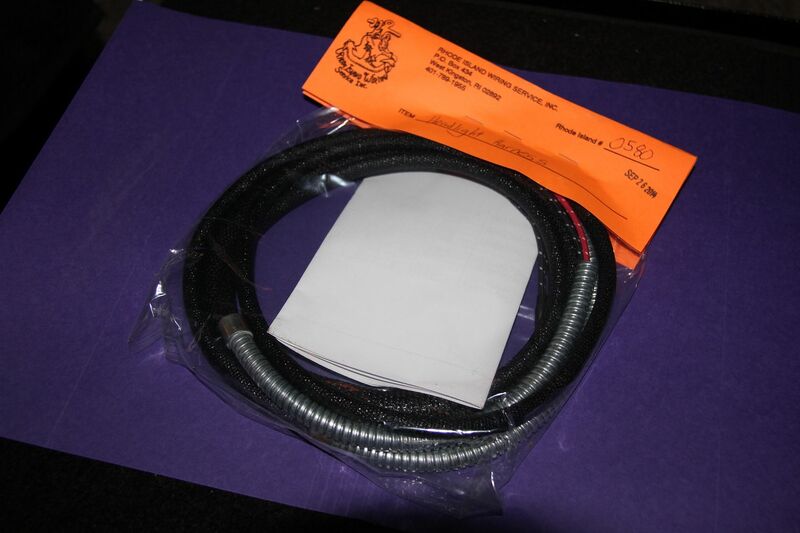 I also received my new wiring harness from Rhode island Wiring. 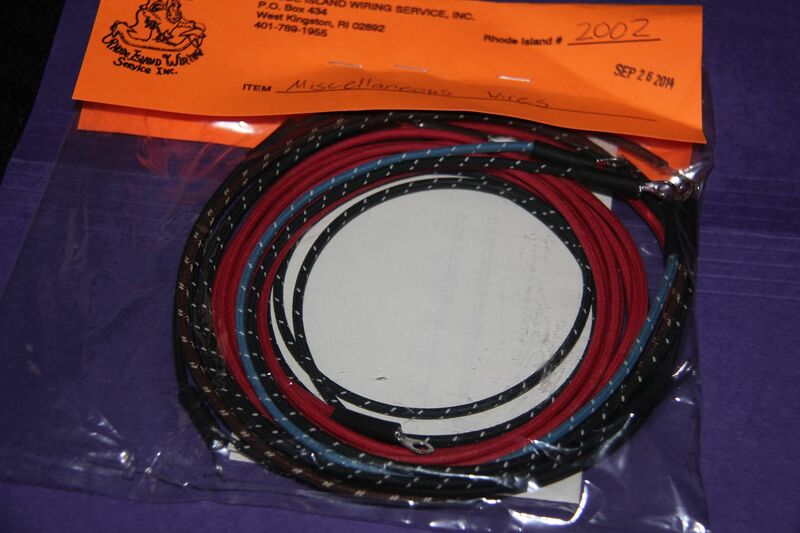 I used them for the rewire on my 1948 Plymouth, so I went with them again. I was very pleased with the materials they sent. As usual, it was well packaged and complete - everything individually bagged and labeled. My harness has very few visible wires - everything was wrapped in a loom. This is the reason I felt I couldn't do the wiring myself. 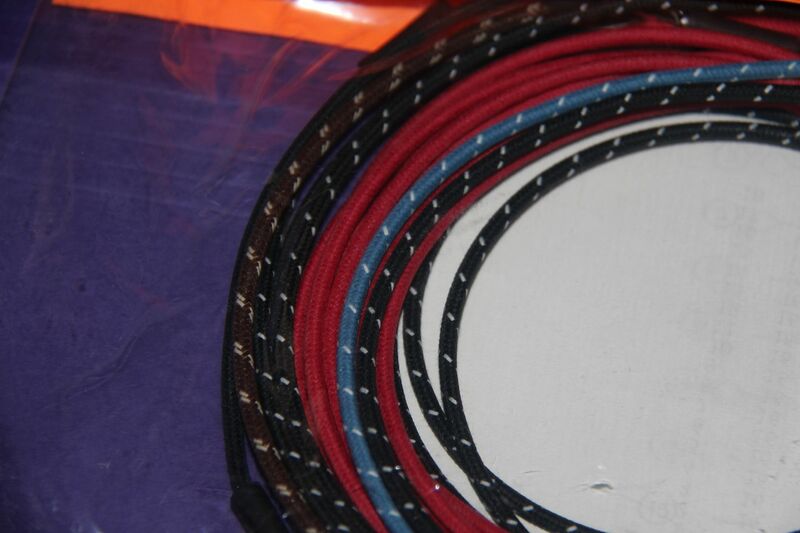 The harness arrived in a beautifully done loom with the original blue tracing. 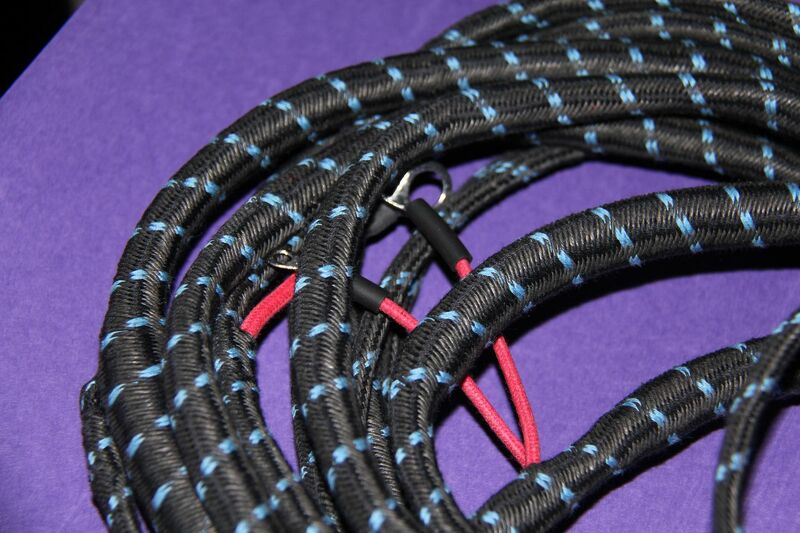 The individual visible wires are in the original color and tracing with the correct connectors in place. 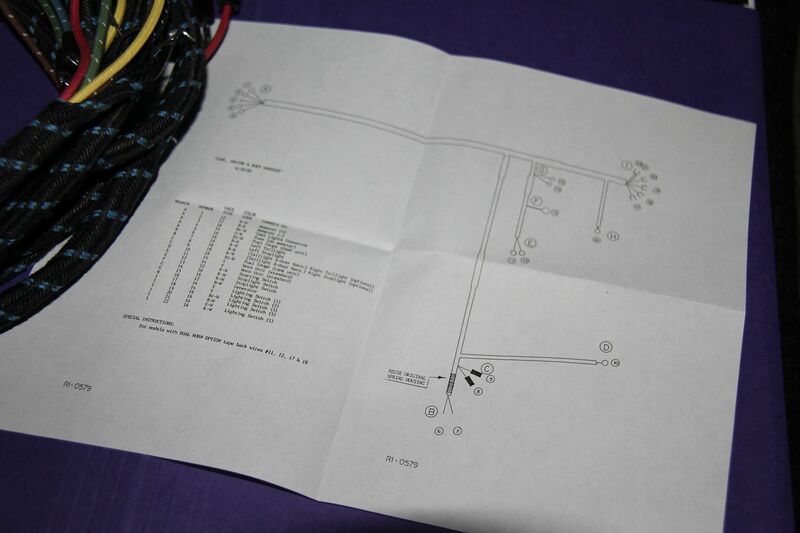 I detailed wiring diagram is also provided. Pretty simple for this car. The separate headlight wiring has the stainless metal covers as per original. 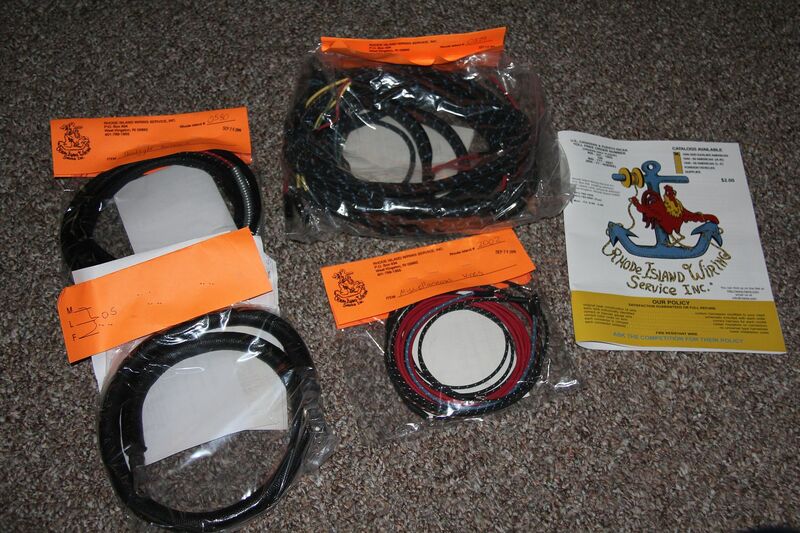 I also got a package of wiring for under the dash. 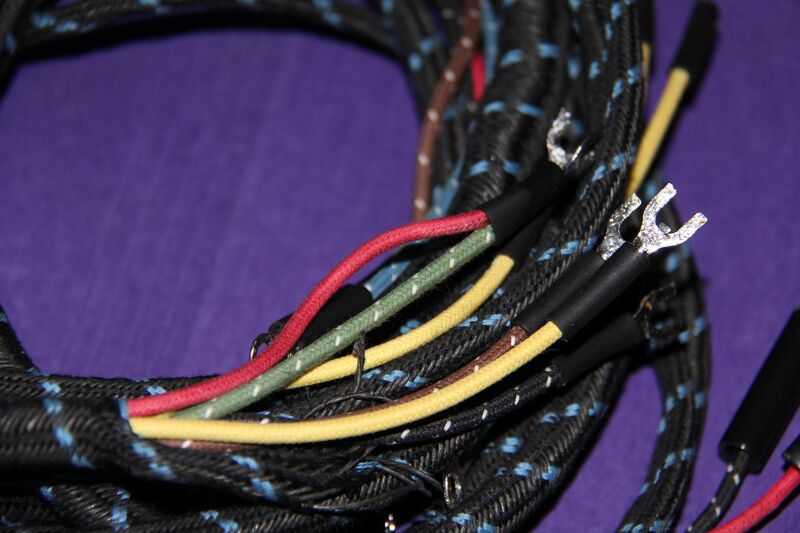 Love the colors and tracing on this new "old" wiring. 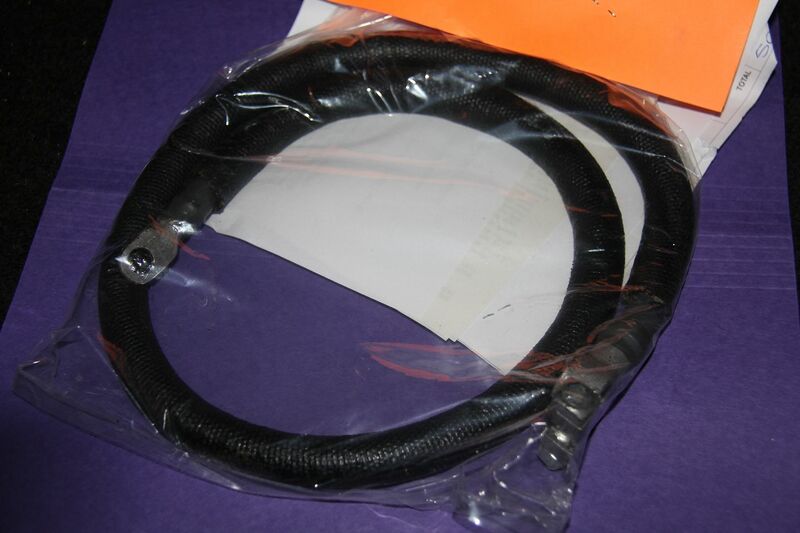 And, finally, a battery cable with the correct large gauge for a six volt system. Overall, I'm very happy with what I received. Very nice job on the seats! And thanks for showing the new wiring harness. It helps to see the quality of work done by Rhode Island Wiring. 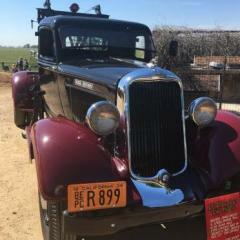 We'll be replacing the wiring on our '36 Dodge and will give them a call. Very nice job on the seats! Not to be mean or anything but the upholstery looks mediocre at best. What shop did that? I live in IL and wanna make sure I don't go there by mistake. WOW! Nice job on the seat. Let see other results. Like to see Joey work that has been done to compare. If that was my car I would be pissed. Here's a comparison. 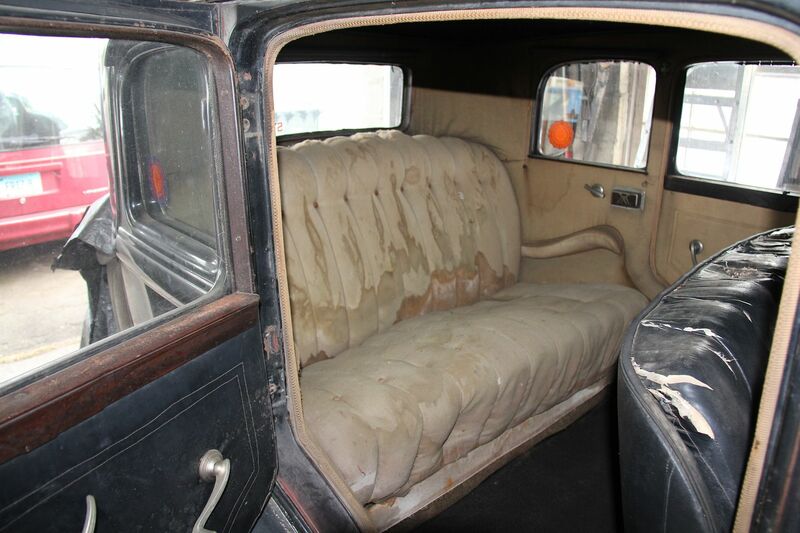 I had a '35 Dodge a number of years ago (which I've since sold) that a guy completely gutted and re-upholstered for me in Southern IL and again no offense but there is a difference. ^^^ it does look nicer to me. Maybe Taylormade's seats will look better installed. I appreciate the effort you both have gone to, to post the pictures. I will print them out and take them to my upholsterer to show him the period styling as mine are in disrepair. 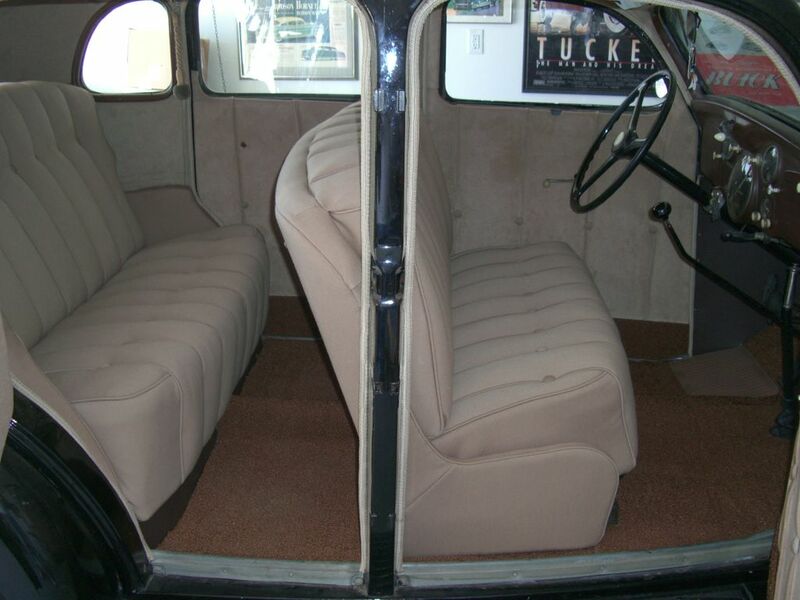 Seats look good but what happened to the door panels???? or are you just missing the moldings?? One of the reasons I love to post on this forum is the honest feedback I get from other members. You always love to get compliments and kudos on your restorations, but I really like to get critical posts when they are warranted. 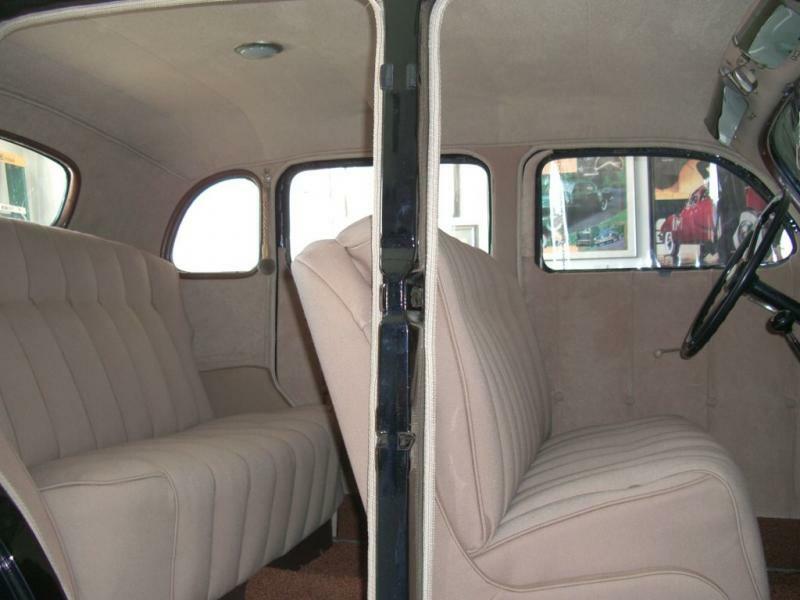 In the case of the back seat upholstery, I'm afraid I have to agree with joeybst999 - they do look amateurish. When I went to pick them up I was very disappointed by the wrinkled seams and uneven stuffing of the pleats. 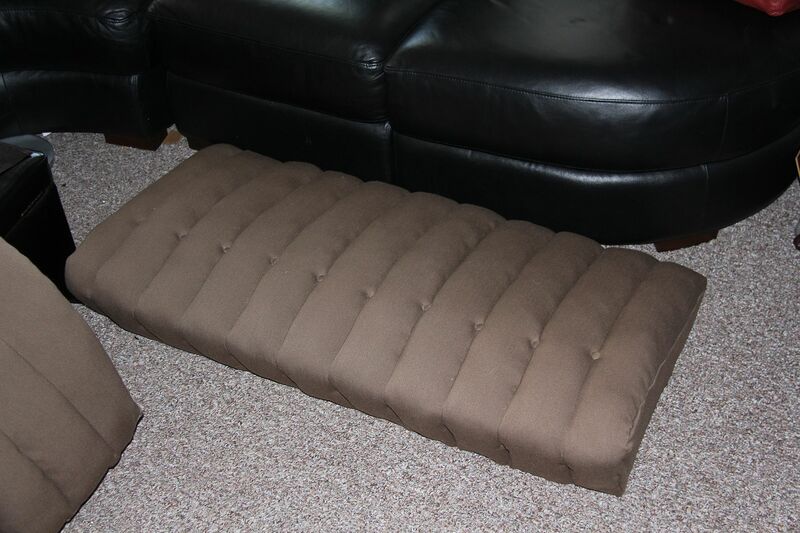 I let things stew for a few days and posted shots of the seats without comment to see if anyone out there thought they were as bad as I thought they were. Believe me, in person, they look much, much worse. So, I've parted ways with the gentleman who did the work. Thankfully, he didn't do the front seat. I took the seats to another shop that is actually closer to our new home and after seeing some of his work we came to an agreement. 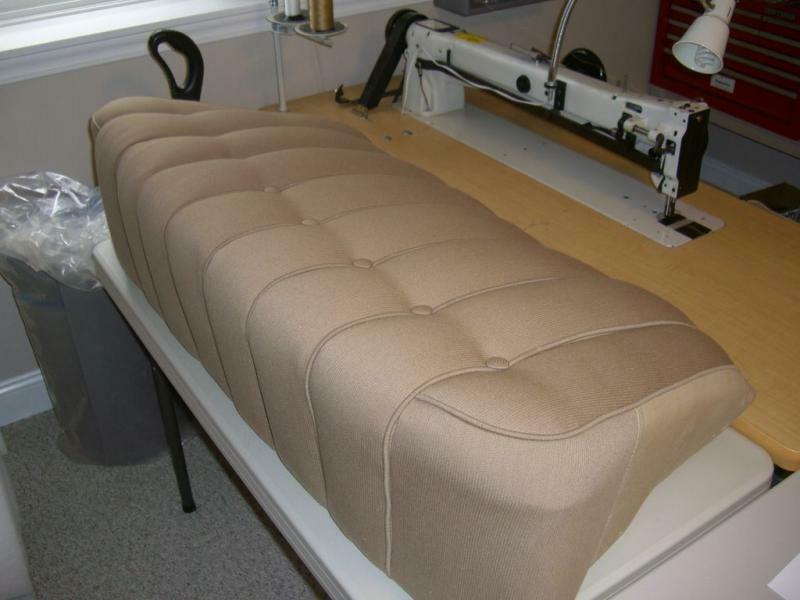 He feels he may be able to save the upright half of the back seat, as it's correctly stitched but needs to be taken apart and correctly padded. The bottom of the seat is probably toast as it wasn't padded correctly under the upholstery and will not be long enough in the front to accept the added padding. Another live and learn experience, one step forward, two back. This car will be a driver, not a Pebble Beach showpiece, but I want it to be as right as I can make it within my budget. 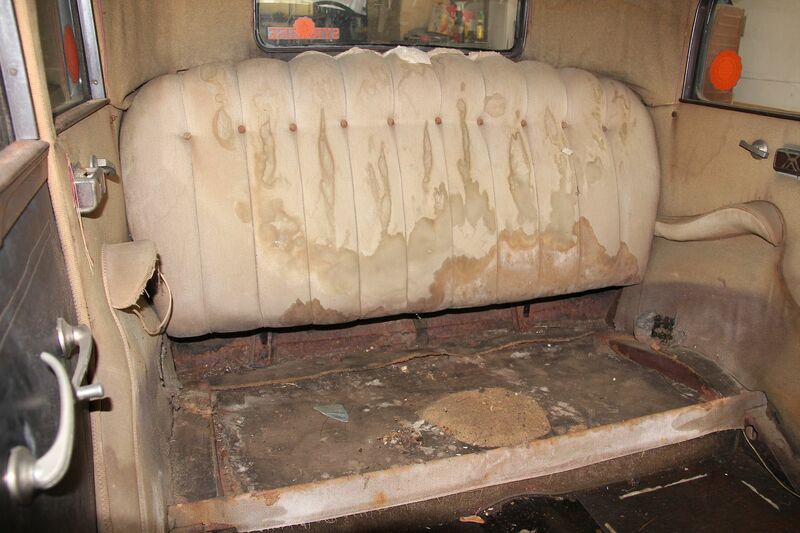 I've done all the work on the car myself when I can, but the upholstery is beyond my skill level. I'll post shots of the redone job for comparison when it's finished. Wow! One of the best and most commendable posts ever. Not only did Taylormade NOT get upset at the feedback, but welcomed it. I will admit, I agree with the poor job on the seats. I did not want to say anything because I know it would be upsetting to me to spend a bunch of cash to have the seats done and have them turn out that way. Hopefully, the new interior guy can fix them. Keiser31 has expressed better than me how I expect many of us felt about the brilliant response from Taylormade to constructive criticism. I am really pleased that a better trimmer has been found. Looking forward to seeing the results. I've seen the high level of quality of put into the car so far and those seats would not been close to that. Just an observation....the thing that stood out the most to me on the seats were the buttons. I think they are supposed to follow the curve of the top of the seat. Other than that, as Taylormade said, some re-tucking and some more stuffing should help. Love the seat material color choice to go with the black! If you check this shot of the original upholstery, water and mice urine stains included - you can see the buttons go across in a pretty straight line. There may be a very subtle curve, but not much. 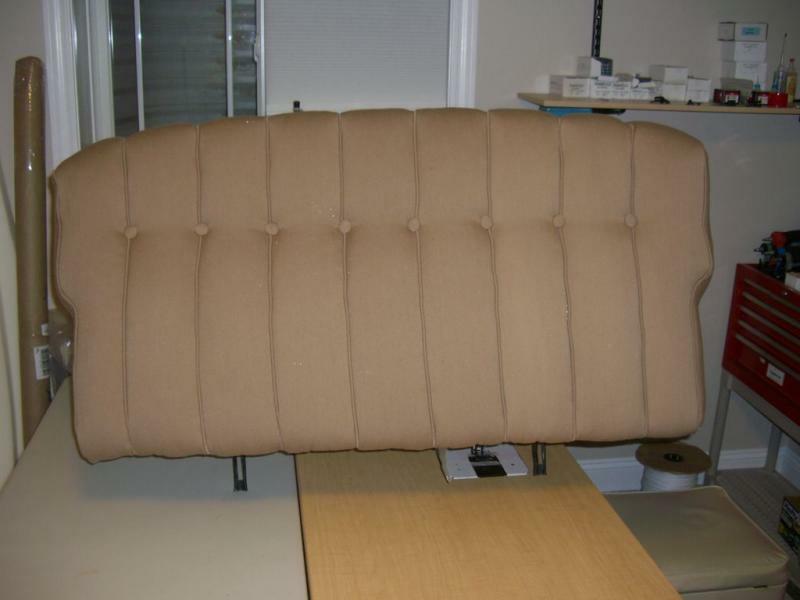 Notice that the top of the seat seems to have a more pronounced curve than the reupholstered seat. Some of this is an optical illusion as the stuffing is coming out of the top of the old seat where the sun and wear produced a hole in the old fabric. Still, the seat should be padded to achieve a definite curve at the top. 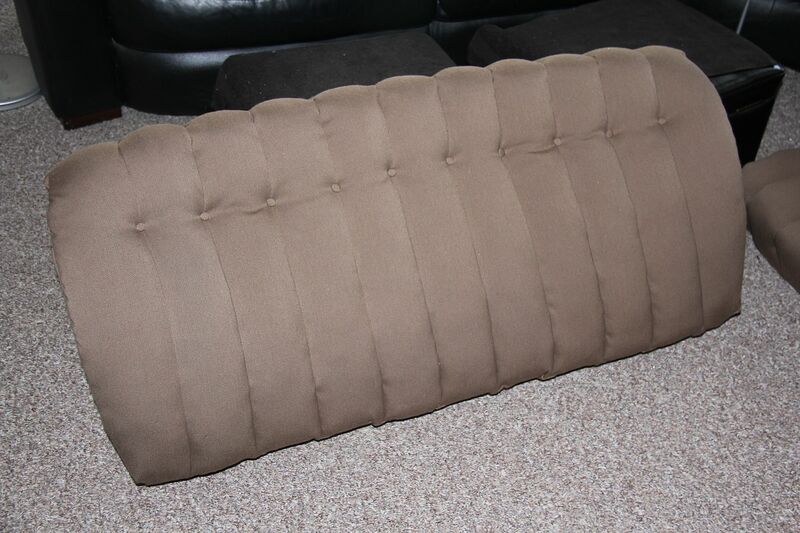 Correctly padded, I think the buttons would form a slight curve as you mentioned. Sometimes, no mater what you do, the restoration process just seems to be one problem after another. After the upholstery debacle, I decided to tackle something about which I actually have some knowledge - the braking system. Daphne needs a total rebuild: cylinders, master cylinder, lines, linings and drums turned. 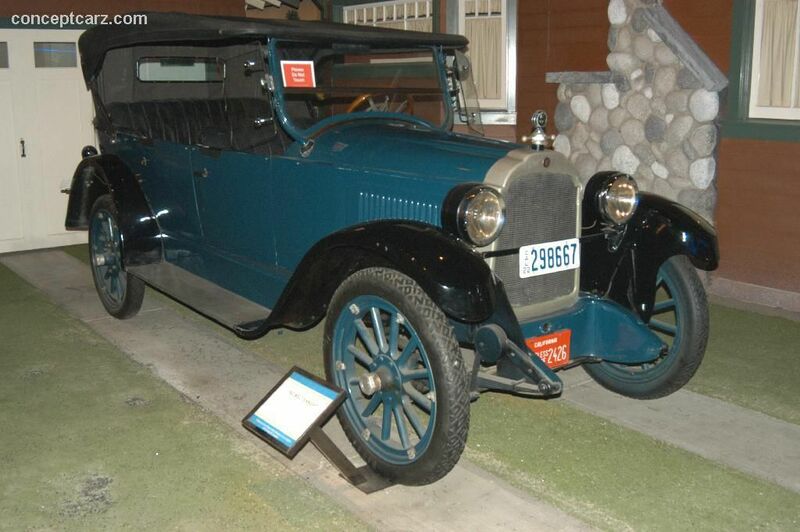 After examining the brake cylinders, I noticed the Dodge Brothers/Chrysler engineers, in their infinite wisdom, used different cylinders on the front and back of the car. The bolt spacing on the front cylinders is narrower than on the rear, and the rear cylinders have a slightly smaller bore. You can see the spacing difference here, with the front cylinder on top. The front cylinder has a bigger bore, maybe a 1/16th of an inch. 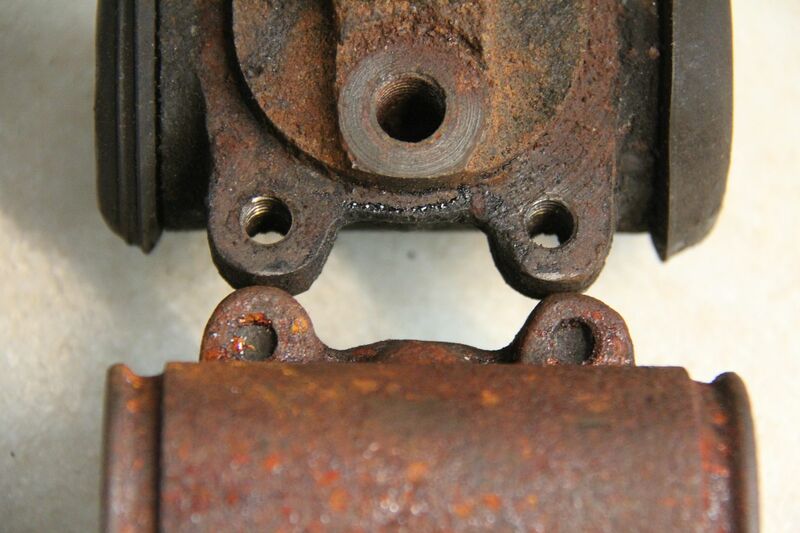 So, do I get my old cylinders re-sleeved or buy new ones? I thought new ones might be an easier fix. WRONG! I call around to the usual suspects (Roberts, Bernbaum) who advertise that they carry cylinders for a 32 Dodge Brothers DL. Their reply -"well, we do, sort of. You can make what we have work, but they aren't original pattern." Okay, I guess re-sleeving is the order of the day. But WAIT! 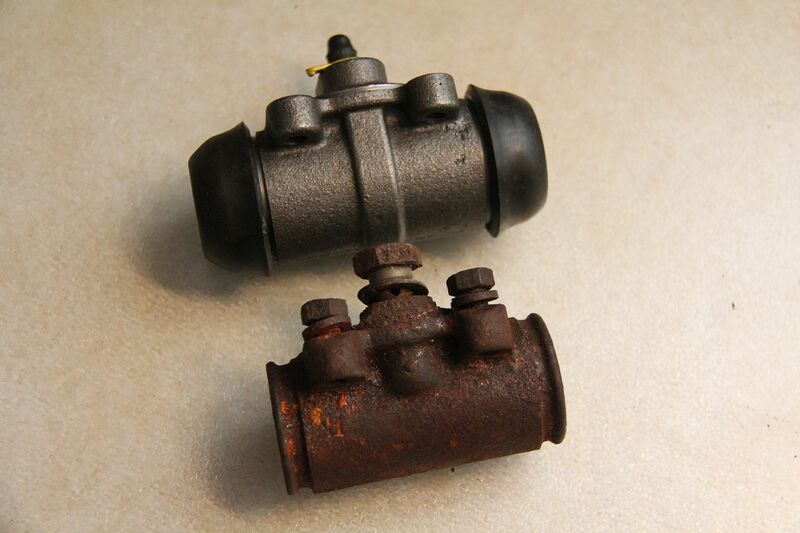 There, on the dreaded EBay is a listing for four new brake cylinders that fit a 1932 Dodge DL. Right there in black and white. Hmmmm, better check this out. 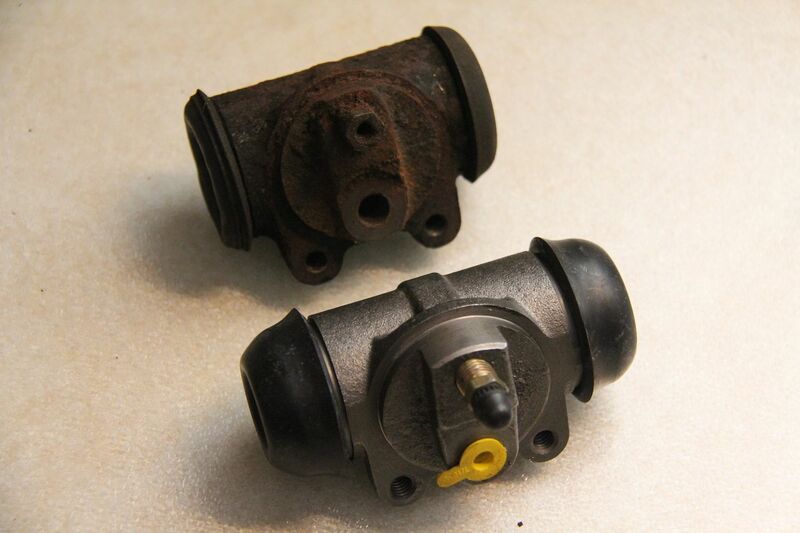 I send a friendly note to the seller, "You do know that the front and rear cylinders are different on this car? " "Yes," he quickly replies, "they are different." With utter trust I send in my hard earned cash. 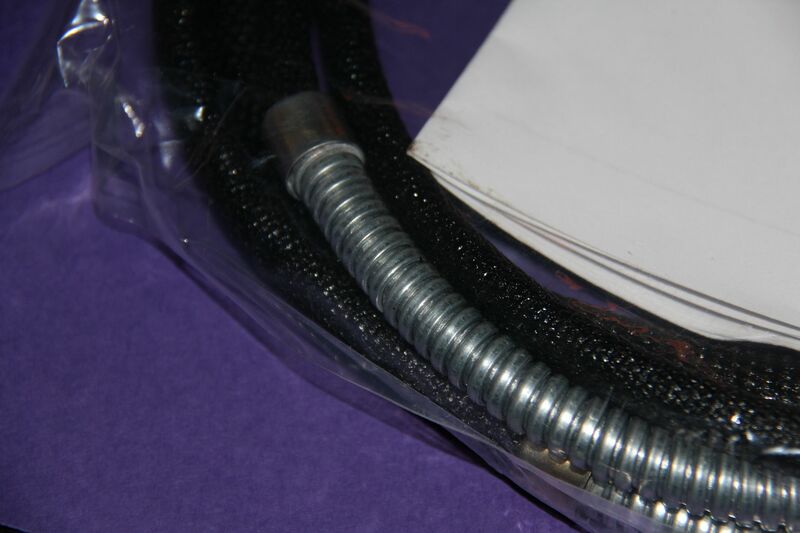 Several days go by and then my cylinders arrive, nicely packaged, new and shiny, ready to go on my...but WAIT! NOOOO! The bolt spacing on all four cylinders is the same. He's sent me four rear brake cylinders. Drat! I dash of a new missive to the seller informing him of his grave and possibly costly error. He quickly replies, "I apologize for that, I must have mixed you up with another person the 32 does indeed use different cylinders and I fear that I do not have the correct ones for that car, you can keep the rears and I will give you a full refund if you would like." So the guy is at least honest - I hope, since I don't have my refund yet. But I also don't have my front brake cylinders, and I'm not too happy that since I explicitly asked him if the cylinders he was selling were different.. I also noticed that the casting on the new cylinders is different than the originals. Notice the band around the center of the cylinder, not present on the original. Everything else seems to be the same, bolt spacing, length, bore, attaching area, so I think I'll be okay using the two on the back drums. So, it's back to the drawing board for the front cylinders. I guess I'll be sending them off to be re-sleeved at Apple Hydraulics as they are also rebuilding my shocks - another task that I discovered was bit beyond my skill level. I was okay until I discovered I was going to have to machine out the seal area to get a modern seal in where the shaft goes into the shock housing. One step forward, two steps back. I'm working on a 41 Dodge 3/4 ton truck-front from rears different size.